This is a new design by Diamond Jim Tyler. DJ often looks for things that are intrinsically magical to inspire his performances and to reach the subconscious of his spectators. Neuro-linguistic programming techniques and subliminal suggestions like this help to coax the audience to respond more strongly to your magic! The black and white card backs feature ancient imagery based on the Mayan calendar, a compass rose, sugar skulls and more. The cards are poker-sized Bicycle stock with an "apocalyptic" finish. The deck was licensed with Bicycle faces so they can be implemented into 808 decks for various magic routines. This deck manufactured by the United States Playing Card Co. includes two duplicate Jokers, a unique Ace of Spades, a blank-faced card, a double-backed card and a secret one-way design. Buy them before the world ends on 12-21-12. The clock is ticking! The new "red seal" deck has a more expensive finish which USPCC calls a "magic finish". Serious card workers prefer it. The black and white seal decks have a smooth finish. 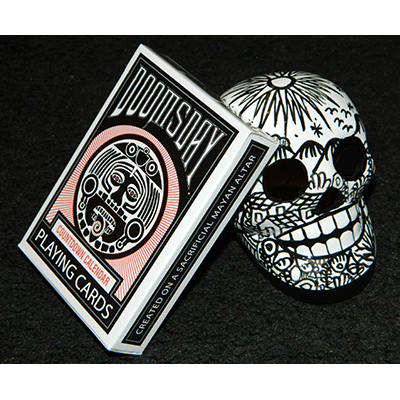 Doomsday Deck (Red Seal) This is a new design by Diamond Jim Tyler. DJ often looks for things that are intrinsically magical to inspire his performances and to reach the subconscious of his spectators. Neuro-linguistic programming techniques and subliminal suggestions like this help to coax the audience to respond more strongly to your magic!